In Kate Atkinson's 'Transcription,' Life Catches Up To A Teenage WWII Spy The young protagonist of Kate Atkinson's latest historical novel finds herself working for British intelligence during the war — and suddenly confronting that experience years later. During World War II, the British were worried about their own countrymen with Nazi sympathies. 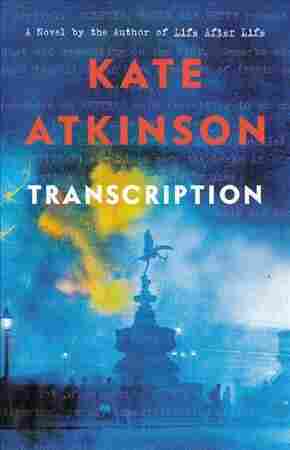 That's the historical basis for Kate Atkinson's new novel, Transcription. It follows a character named Juliet Armstrong, who was recruited to the British Secret Service as a teenager to help monitor fascist sympathizers in 1940. "And she's very naive," Atkinson says in an interview. "But at the same time, she's been a scholarship girl in a good school. And I think that means that Juliet's already been slightly moved out of her natural environment. She's already 'other,' in a way. And also, it should be said that she's a pathological liar — which is clearly why the Secret Service would be interested in her." Juliet transcribes secretly recorded conversations with an undercover MI5 agent named Godfrey Toby. A decade later, while she's working for the BBC, her past truths and lies suddenly confront her again. Atkinson's previous two novels, Life After Life and A God in Ruins, were also set during World War II. For Transcription, she mined declassified MI5 documents and found the man who became the model for Godfrey Toby — and the unnamed typist who logged his conversations. At one point, they were given little medals — their sort of civilian iron cross, which they were to wear under their lapel. And they wore it to conceal beneath their lapel so that when the Germans invaded, they could just turn their lapel and quietly show the invading German army that they were actually sympathizers. It's side-by-side with this, really, kind of tedium of their conversations. And then you suddenly — you're almost lulled into not hearing what they're saying, and then you suddenly realize that this hatred is simmering away beneath them in their breasts. And they're not — they really could be your neighbor, and I think that's the frightening thing. A lot of people asked me, "So, were you very conscious about the referendum about Brexit? About Trump being elected?" and so on. ... This was happening when I was writing it, but I was writing it — I started it before then, and certainly the germ of the idea was very strong before that. And I just think, of necessity, I'm writing about things that happened — I know in fictional form — so the fact that the same things are happening now, it's just history repeating itself. I'm not actually trying to make a comment, because I started the book before the — you know, I wasn't seeing this book as any kind of comment or message or a book about these things, but those things happen to be happening again. And I do — I think history is doomed to endlessly repeat itself.